Accustom thyself to the holy service of this inward temple. In the midst of it is the fountain of living water, of which thou mayest drink, and live for ever. There the mysteries of thy redemption are celebrated, or rather opened in life and power. There the supper of the Lamb is kept; the bread that cometh down from heaven, that giveth life to the world, is thy true nourishment: all is done, and known in real experience, in a living sensibility of the work of God on the soul. There the birth, the life, the sufferings, the death, the resurrection and ascension of Christ, are not merely remembered, but inwardly found, and enjoyed as the real states of thy soul, which has followed Christ in the regeneration. When once thou art well grounded in this inward worship, thou wilt have learnt to live unto God above time, and place. For every day will be a Sunday to thee, and wherever thou goest, thou wilt have a priest, a church and an altar along with thee. This book is dedicated to those many people who, perhaps because of some physical impediment or social misfortune, are obliged to live alone. The experience can be shattering if a deeper spring of personality is not unveiled within and a more profound meaning to life revealed. It is a fearful sensation to feel cut off from one's associates on a deeper social level, because one can hardly escape the suspicion that there must be something radically wrong with oneself that one has had to embark on a solitary mode of existence. In fact, all experiences bring us closer to the core of reality within us if we have the courage to persist on the path. The celebrated Socratic injunction that we should know ourselves is the path of all wisdom. But it must be prefaced with the biblical dictum that the fear of God is the beginning of that path. A period of separation from the complacent reassurance of worldly society is a most potent way of arriving at that appreciation of God's providence and the deeper knowledge of the self. Indeed, it is open to doubt if there is any other way towards this understanding. Living alone is a very individual experience. Each one treads it according to his own gifts, insights and temperament. 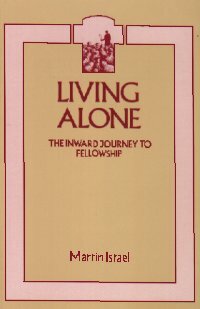 But one fact stands out: until one has come to terms with one's own personality and has attained an inner rest in the silence of aloneness amid the outer turmoil of the world all one's gifts are inadequate to assuage the loneliness, indeed the meaninglessness, of one's present existence. This book explores the inner life of a person with special reference to living on one's own. It outlines the path to awareness that finds its end in the direct encounter with God. It is to this end that man was fashioned. It is first glimpsed in the silence of aloneness, but it is finally consummated in a truly communal life that is the fruit of a period of living alone well spent and fully used.